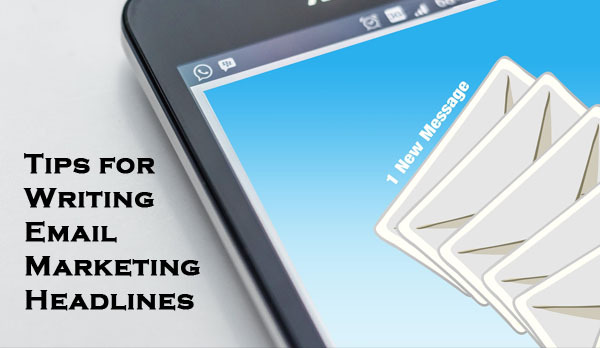 Keep reading to learn more about writing fool proof email marketing headlines that are good for your email marketing campaigns. Tips for writing effective email marketing headlines. Long-winded email headlines don’t sell. They drive people away and are quite hard to read. If you want to come up with an email headline that is attention-grabbing and extremely powerful, you should definitely consider toning down the word count and avoid “big” words. Even though you think they might make you sound smart, keeping it simple will ultimately add to the clarity and punch of your content. To entice your readers, you need to be able to provide clear value to your customers and articulate why they should click and continue to read the rest of your email. It’s easy to forget that as online users, we’re being targeted with content all the time. As I am typing this sentence, I can see 3 ads in my browser and a lot of other reference content! With so much competition out there, it’s important to use a catchy, simple and direct headline that is quite easy to catch on. You want your title to be outstanding in a pile of unread emails! It’s very important for your headlines to target special events, holidays or sales. Black Friday, Christmas and other sales events are fundamental to any business, and email marketing headlines should reflect that. In conclusion, writing amazing headline is one of the most powerful things you can do to improve your email marketing success rate. However, there are many other clever things you can do. For example, you can use dedicated email marketing software solution such as EMMA. This program is particularly well-conceived, designed with the needs of email marketers in mind. People respond much better to headlines that feel more casual and conversational. Normally, this writing style is seen as more “personable” and “upbeat.” This is exactly the tone you should strive for in a commercial email, at least in most circumstances. You don’t want to sound aseptic and sterile. You want to sound excited about bringing value to the reader! If you want to connect with the reader, asking a question could be a great way to captivate and engage. Find a few examples below! – Feeling thirsty? Don’t miss out on our new summer juices! – Too busy running your business? Our virtual assistants are available 24/7! – Need new shoes? Don’t miss out on our massive year-end sale! – Learn to write better emails with our new free ebook. No strings attached! Notice how the text speaks to the reader directly, utilizing active language (“learn…”). It also clearly shows the value the company is offering to the readers (“a free ebook”). To top it off, it ends with a warm casual expression (“No strings attached”) which adds a more personable tone to the headline.